This residential condominium building at 200 Eleventh Avenue in Chelsea has a very rare apartment amenity: private garage spaces within the apartment. Given its location and vistas, that is enough to qualify the building as unusual and very desirable, but it has more going for it. Its bottom and top have two completely different and equally stunning facades. The former is a gun-metal terracotta with protruding piers and an arched and curved cornice with four-pane windows. The latter, comprising the setback tower, is stainless steel with mutli-paned windows and curved balconies with glass railings. The overall aesthetic influence is industrial and, to a certain extent, post-modern, but its facade textures make this much more than a contextual project. One tends to think of stainless steel as streamlined, like the Art Deco-style top of the Chrysler Building but the "dull" terracotta base brings things back to earth and the generous and sophisticated use of curves provides the building with an "organic" dignity and individuality. The New York City Council approved a special permit to allow 12 additional parking spaces for the project, which does not sound too unusual except that its parking spaces are not in an underground garage but will be in 14 of its 16 apartments. 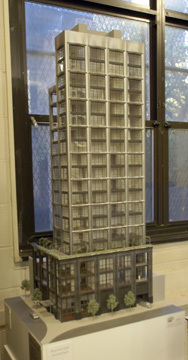 The building, which is at 24th Street and overlooks the Hudson River, has been designed by Annabelle Selldorf for GAIA House LLC, a partnership of Youngwoo & Associates and Urban Muse, and uses the "En-Suite Sky Garage System that uses an internal elevator to bring residents in their cars to garage rooms immediately adjacent to the apartments. Steven Kratchman was the architect of record. 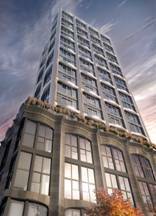 "We are thrilled that 200 Eleventh Avenue will be the first condominium in America to offer this incredible amenity," Glauco Lolli-Ghetti, a director of Youngwoo & Associates, said following the council's approval. His firm said that "sensors and monitors at the elevator's entrance are alerted when a car is present, recognize each resident's car, welcome and direct them into the elevator." The system was conceived by the developer and designed by Ms. Selldorf with elevator engineer Jon Halpern with assistance from Bradley Rickert of Siemens. 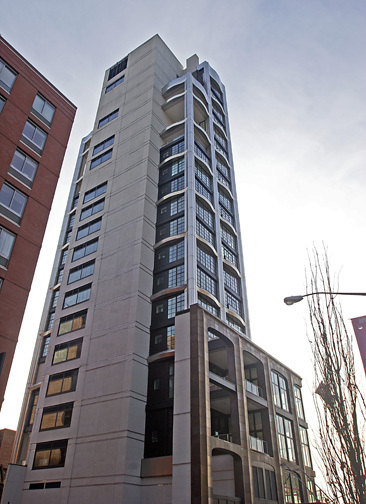 Initially, prices for the apartments began at about $6 million and occupancy was planned for Fall 2008, although the building was not completed until 2010. The New York City Planning Commission had voted August 8, 2007 to approve a special permit for 12 additional parking spaces, but Community Board 4 voted 31 to 10 with one person stating he was present but not eligible May 2, 2007 to recommend that the special permit not be granted. Several speakers at the community board meeting had argued that while the number of requested parking spaces would not have a serious impact on the community a granting of the request would set a bad precedent since the city's zoning laws. The resolution passed by the board noted that "the application is admittedly novel," adding that it is "contrary to PLANYC's recently announced program to reduce vehicle trips and presence in mid-Manhattan" and "if granted, would by permitting accessory parking for some 90 percent of the apartments, set a dangerous and unwarranted precedent undercutting the intent of the Zoning Regulation if applied to larger buildings." The city's recent rezoning of West Chelsea and the High Line area did not alter the city's zoning regulations relating to parking even though Chelsea, as well as other parts of Manhattan, has witnessed an evaporation of parking lots as they have been gobbled up for development in recent years. The garage "rooms" may be the building's most unusual feature, but its most visible feature will be its unusual façade that its website maintains was "inspired by neighboring industrial lots, the concepts of Erwin Hauer and structural forms found in nature." Erwin Hauer is an Austrian designer who in 1950 "began to explore perforated modular structures that lent themselves to architectural usage" and he taught at Yale University from 1957 to 1990. In 2004, Princeton Architectural Press published "Erwin Hauer: Continua," and he and his partners in Erwin Hauer Studios in Bethany, Connecticut, are, according to that company’s website, now "regenerating his designs and adding new ones, using contemporary digital technology and production methods." The planning commission's approval noted that it "recognizes that there is limited existing public parking in the immediate vicinity and that there is limited capacity within these facilities." It also noted that "The development of the High Line elevated rail structure into public open space and continued growth of the West Chelsea art gallery district may create further demand" and therefore it "believes the proposed garage would appropriately serve the needs of the residents of the residential building" and "the small increase would not unduly inhibit traffic and pedestrian flow." The building has a full-time attended lobby with a second level gym and fitness center with a terrace. It has key-lock elevator entry and storage facilities. The apartments have living rooms with ceilings of 16 to 24 feet and large windowed doors thatopen to glass balconies. Master baths include hand-carved, freestanding honed granite soaking tubs, a separate glass-enclosed shower with Pyrolave walls and granite floor, dual undermount sinks, and custom linen-and-medicine cabinets with acid-etched mirrors. Custom disappearing kitchens integrate with living areas, as oiled teak folding doors close to become wood-paneled walls, instantly concealing the entire kitchen. Teak islands with an unique drop-leaf side function as counter space for cooking, a serving buffet or a table. Ms. Selldorf is well-known for her design of the interior of the Neue Gallerie on Fifth Avenue at 86th Street and the Abercrombie & Fitch store on Fifth Avenue at 56th Street.